The MUXC01 multiplexer is specifically designed to work with the Smartec Universal Transducer Interface (UTI). The combination of the UTI and the MUXC01 makes it possible to measure multiple capacitances with a very low capacitance value and a very high accuracy (15 bits). The number of capacitor being measured can be increased by cascading the multiplexers, Each multiplexer contains a 9 bit shift register and can measure 9 capacitors. As the capacitance measurement is based on charge transport, special attention is given to the outputs of the circuit. Through careful design, the multiplexer has an output impedance of less than 20 Ohms and the rail-to-rail output voltage is well defined. These features make the combination of the UTI and the MUX C01 multiplexer the best solution for measuring multiple capacitances. By constructing arrays, each possible capacitance structure can be measured easily and accurately. 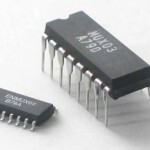 The device is available in DIL or SOIC package and as bare die.